When you are living paycheck to paycheck, your finances just feel like a vicious cycle, a seemingly never ending on. Somehow it always seems like as soon as you start to get ahead something happens and sends you back to barely scraping by. I’ll be honest, getting out of living Paycheck to Paycheck doesn't happen overnight. It takes time and consistency in your actions. One of the mistakes I made when working to get out the paycheck to paycheck lifestyle was to think that I needed to be paying ahead, pay January’s bills with December’s income and eventually, you do need to do that. But to get to that point you have to do something else first. You need to build up an emergency fund so that once you get to the point that you are paying ahead when something comes up, you won’t end up right back where you started. First, you need to decide how big you want your emergency fund to be. Personally, my goal is $5k because in my experience when it rains it pours, I want enough to cover more than just one emergency. I'd say a good rule of thumb is to have enough for 2-3 emergencies. To figure out how much that is, take a look back at your last few emergencies and how much they cost. If you try your hardest not to think about those emergencies, then just start with $1,000. What amount will work for you will likely be different than my goal amount. Once you decide how much you need in an emergency fund, you are going to break down that goal into manageable chunks. My emergency fund started with saving $25 per month. It doesn't have to happen all at once. Doing things like setting aside spare change in your budget, automating savings with direct deposit, or using automatic savings programs through your account like Chime to round up your transactions and save, you can build up an emergency fund. It just takes a bit of time. Related: How Much Should I Have in Savings? But I don’t have any extra money to save! Yes, you do, you can skip the dryer and air dry your clothes to save on the utility bills, you can cut your cable or Netflix, you can pick up a gig on craigslist or sell something on craigslist and put the money you make towards your emergency fund. Where there is a will there is a way. You don’t need to start saving massive amounts. Start with the $7.99 from Netflix, then the next month sell something, you’ll be able to save the $7.99 from Netflix as well as the $25 you made from selling something. By the end of month two with very little effort, you will have saved almost $40. It is a start, don’t be discouraged by how long it takes to build that emergency fund. I’ve been steadily saving for two years and with a few emergencies popping up I have yet to reach the elusive $5k but I’ve got $3k saved and I consistently save $200 a month by having it automatically deposited from my paycheck. When I started saving that number was $25 a month, then it was $50, and a year later it was $200 a month. Having that extra cash stashed away gives me a lot of security, if something were to happen to my next paycheck, I'd be ok, my emergency fund keeps me from living paycheck to paycheck. If you get paid via direct deposit, find out if you can have your check deposited in multiple accounts. If so, make sure one of them is a separate savings account (more on this later) for your emergency fund. Choose an amount you're comfortable with, it could be $5 to start. Since it automatically gets put in your savings you'll never miss it from your checking account. If your work doesn't allow for multiple direct deposits, you can usually set up a regular automatic transfer from your checking account to your bank account. It would likely work best to have the transfer take place a few days after each time you are paid. Alternatively there are tons of apps that can help you to save automatically based on preset rules. Qapital can help you reach savings goals. It allows you to set personal savings goals and then rules for saving money. You could set a rule to round up a certain amount into savings, or automate the 52 week savings challenge. Next, you need to decide where you are going to put your emergency fund money. If it stays in your checking account you will most likely spend it, which is why you should put it in a separate savings account. I like and use CapitalOne360 because it allows me to have multiple savings accounts for different savings goals it also has a decent interest rate. I have an emergency fund account, travel account, and car insurance savings account. CapitalOne also has a really good interest rate compared to other banks, currently, it stands at 0.75%. No matter where you decide to stash the cash you need to make sure it is easily accessible in the event of an emergency, which is why a CD or investing it, might not be the best idea. Once you reached your emergency fund goal, you can start to use that extra cash you had put towards your emergency fund towards building a buffer in your checking account. 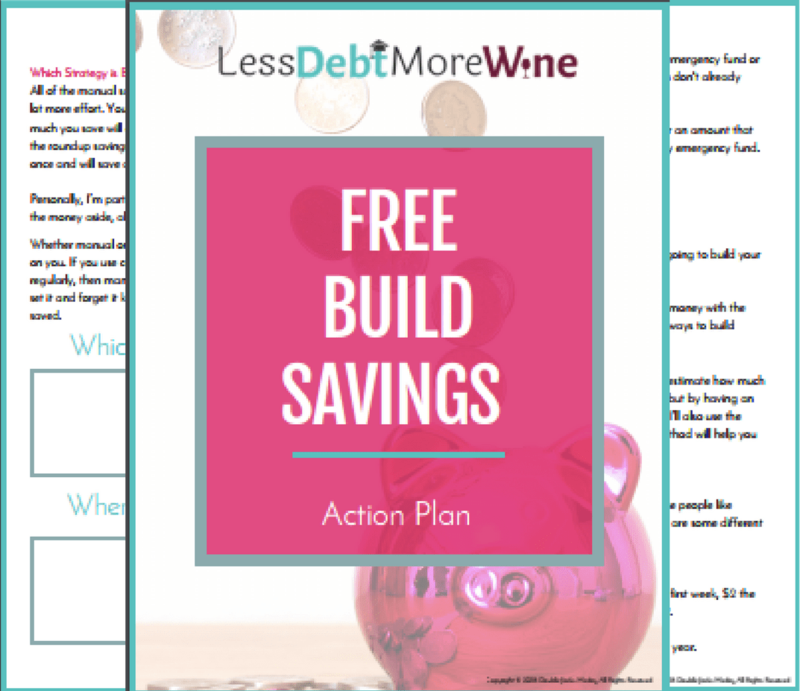 If you ever have to use your emergency fund afterward, you do the same thing to build it back up again. Not all unexpected expenses are emergencies. For example, a parking ticket or a slight uptick in your cost for insurance isn’t typically classified as an emergency. You weren’t expecting them but you probably don’t want to be raiding your shiny new emergency fund for every little expense. This is why having a little flexibility in your budget is important. You also need to have a flexible budget to cover small unexpected, but not necessarily “emergency” expenses. Once you’ve done that you’ll slowly work your way to paying a month ahead with the cushion of an emergency fund and a buffer in your account keeping you out of that cycle even when something does come up. I know budgeting doesn't sound super fun, but that's probably because you associate it with restricting what you can or cannot do with your money. Really a budget just helps you to plan how you'll use your money to reach your financial goals. If you start thinking about budgeting that way, it'll be easier to stick to the habit of budgeting. A budget is a plan and a key part of that plan should be having a buffer. A buffer is there to cover all those little unexpected or forgotten expenses that come up throughout the month. A buffer allows some breathing room in your budget because we all know very few things actually go exactly to plan. A budget is a plan, a buffer is a backup plan. Your buffer doesn’t need to be huge. My buffer generally consists of what is left over when I’m done budgeting the rest, sometimes it’s $50, sometimes it is $125. The point is over time it builds because I don’t always need all of it every month. If you are budgeting your paycheck rather than your bank account balance (which is what you should be doing) you will see the buffer grow with very little effort. Little by little with each paycheck the buffer will grow and have the ability to cover any number of unexpected expenses. Once you have a decent sized buffer you can keep adding to it but at a slower pace as you start to pay bills a month ahead until you are paying all of February’s bills with January’s income. So you aren't paying next week's bill with this Friday's paycheck. The further out you can pay your bills, the less stress you'll have if say there is a technical glitch in your pay being issued. The goal of paying a month ahead is to create an even bigger buffer. Imagine you lost your job today. Yes, you have an emergency fund, but knowing that you have an entire extra month to look for a new job (because all your bills for the next month are paid) helps to lessen the stress of losing your job. It's not just a buffer in your budget its a buffer in your overall financial goals. You don't have to pay a month ahead all at once. Maybe you start with paying your car loan a month ahead, then you build up to paying both your car loan and your student loans a month ahead. You keep going until you are paying all of your bills a month ahead. Groceries. Yup, when I had a regular 9-5, I paid my groceries for the current month using that month's income. I would budget $125 from each paycheck to pay for my groceries, gas, and fun over the following two weeks. Now that I'm self-employed everything is paid using last months income. Just remember no matter where you are in your finances, slowly but surely you can get out of that paycheck to paycheck lifestyle. Just keep going, every little bit counts. Any questions on how to stop living paycheck to paycheck? Let me know in the comments! Good luck! I don’t have any emergency fund and I’ve been plowing 100% of my paychecks into my student loan debt. But your post makes me think that I should reconsider and maybe set aside about $1,000 or so for an emergency. It’s always good to have that cushion and in the grand scheme of things $1k isn’t that much to have to set aside but it can make a big difference when stuff hits the fan.